Low tide and calm winds at sunset usually means excellent tailing conditions off Matlacha and tonight was no exception. This was the only fish we caught but it was my dad's second largest red ever at 33 inches. It was tailing in less than a foot of water and hit a golden Flats Walker lure from FlatsHQ. Since it was 5 inches over the 28 inch slot it was safely released and swam away after this photo. Perfect cast and a perfect redfish. My buddy Capt. Eric Wrenn working his Beavertail Vengeance around an angry tarpon off Pine Island this morning. If you can pry yourself away from the big tarpon that are rolling up the Gulf beaches right now, the reds seem to be back in good numbers on the flats. They were acting a bit lock-jawed early last week on the few days I did chase them but live shrimp and crabs got a few to eat for us. Some of the water out in Pine Island Sound was way too grassy so we stuck to the sandbars and mangroves of Matlacha Pass and spotted plenty of nice reds. Angler Geoff Seed from the UK brought in the perfect 24" fish from the trees just behind the island. We had to wait until a school of small snapper and sheepshead got their fill of shrimp before this guy showed up but creating a minor feeding frenzy under the bushes is a great way to draw in larger predators. An hour long 1973 movie called “Tarpon” is by far the best documentary ever made about saltwater fly fishing. It was shot in Key West by director Guy de la Valdene and perfectly captures the town and the fishing as it was over 40 years ago. “Tarpon” follows a handful of notable guides and anglers such as Tom McGuane, the well-known author of “92 In the Shade,” as they chase these giant fish on the fly off Key West well before the rest of the world discovered the sport. It’s fascinating to see how much things have evolved since those days of thick fiberglass rods and wood hulled flats boats without poling platforms. The sheer numbers of tarpon that these guys had all to themselves is jaw-dropping and the slow-motion footage in this movie, all shot on 16mm film, has never been topped. While the fishing scenes are stunning, my favorite thing about the movie is how it serves as a time capsule for a Key West that sadly no longer exists. I lived and guided on the island for over a decade but I arrived too late to see it like this. The famous Duval Street of the early 70’s, as briefly and beautifully documented in “Tarpon,” was a very different world from the cruise ship infested trinket zone that I rolled into during the early 90’s. The Key West captured in this movie has been extinct for so long that it makes me kind of sad to see it here in its natural state. But the real payoff when you watch “Tarpon” for the first time is its perfect portrayal of fly fishing as a sport that seriously respects the fish. In one single scene it drives that fact home far better than anything that’s ever been filmed before or since. I won’t give it away because part of it is a bit difficult to watch, but when that scene comes, without any dialog or narration, you’ll be stunned at the subtle yet overwhelming brilliance of it. The movie's entire message is delivered in one brief flight of a cormorant. 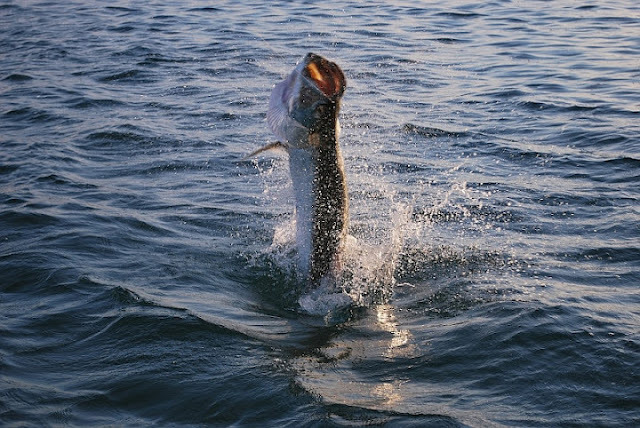 Shortly after it was filmed, “Tarpon” slipped into limbo. It was shown once or twice on TV in the 1970’s and then went back into Valdene’s vault. Somehow, a primitive video tape was made and started getting passed around by a few anglers down in the Keys. Over the last three decades it gained a cult following and we used to play a very grainy copy all day long at the Saltwater Angler fly shop in Key West when I worked there in the late 90’s. We were really sad the day our shop's VCR finally ate our worn out tape and nobody had a replacement. A few years later I was thrilled to hear from one of the folks involved with the 1973 filming that a remastered version would be out on DVD in 2006. When I finally got my own copy later that year, seeing “Tarpon” for the first time in its original state made Guy’s achievement even more brilliant than I ever realized. If you’re a tarpon angler, or serious about any kind of saltwater fly fishing, this movie is a must have. It is the “Citizen Kane” of fishing documentaries. If you’re a Jimmy Buffett fan then you’ll also need a copy. His instrumental soundtrack covers the entire movie with a perfect atmosphere of the Key West that he owned in the 70‘s. And even if you don't fly fish but just appreciate great filmmaking, pick up a copy from Amazon.com anyway. For those of you who live on Pine Island and Matlacha, do yourselves a favor and watch this movie carefully. We're much closer the old Key West of “Tarpon” than anywhere else in Florida. You'll feel incredibly fortunate for what we have here right now and will want to hang on to it more than ever.